Be the first to share your favorite memory, photo or story of Alfred "Butch". This memorial page is dedicated for family, friends and future generations to celebrate the life of their loved one. Alfred C. Graves, better known as “Butch”, of Sterling, CO, passed away in his home, surrounded by his family, on January 23, 2019, after battling cancer. Celebration of Life will be at 11:00 am, Friday, February 1, 2019, at First Christian Church in Sterling, Colorado, and officiated by Jared Sonnenberg. Butch was born on August 23, 1956 in Sterling, CO. He graduated from Sterling High School and continued on to NJC, where he received an Associate’s in Ag Business. While attending NJC, Butch enjoyed time with friends at the local hangout, The Keg, where he met his future bride, Tammy (Roach) Graves. They were married in Denver, CO on March 14, 1981, before welcoming their first born in 1983, Nathan J. Graves, and then welcoming their daughter, Erin N. Graves, in 1984. Butch was an Ag Pilot for 40 years and as he’d be flying early in the morning, he’d watch the sun rise in front of him, thanking God for the opportunity to do what he truly loved. He started his career of Ag aviation in his youth as a flagger/loader for Benson Aviation, later known as Aero Applicators where he sprayed for 23 years. 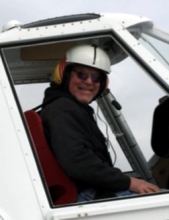 He then moved to flying for Mike Deck of Sky Tractor in North Dakota, and flew his final three seasons for Travis King of King Air, in Cope, CO. Butch loved to golf, ride his Harley, cheat at cards (haha), and watch the Denver Broncos. His absolute happiest place was with his family as they sat around the table or in the hot tub, having beers and sharing laughs. When Butch was young he and his buddies enjoyed traveling to the mountains where they would hunt, camp, and ride motorcycles. Later he would share his love of the outdoors with his family and take them on an annual trip to the mountains where they would camp, ride atv’s/motorcycles, and fish. Butch was preceded in death by his parents, H.L. Tex Graves and Mary Alma “Dolly” Graves, and sister Debbie Brannath. Butch is survived by his wife Tammy, daughter Erin, son Nathan and daughter in-law Marta, his three granddaughters, Emilia, Ensley and Ellis Graves, sister Kathy Bright, sisters and brother’s in-laws Deonne Martinez and Jeff Cohen, Noni and Mike Kobza, Bruce Brannath, several nieces and nephews, and his best friend of 50 years, Tim Peake. Memorials may be made out to CoAAA, the scholarship fund for future Ag Pilots in care of Tennant Funeral Home, PO Box 1547, Sterling, CO 80751. To send flowers or a remembrance gift to the family of Alfred "Butch" Graves, please visit our Tribute Store. "Email Address" would like to share the life celebration of Alfred "Butch" Graves. Click on the "link" to go to share a favorite memory or leave a condolence message for the family.